Bihar JE recruitment 2019 and Application Form: Interested candidates can fill the application forms before the due date. Applicants can submit Bihar JE applications only through the online mode as no other mode of application is available. 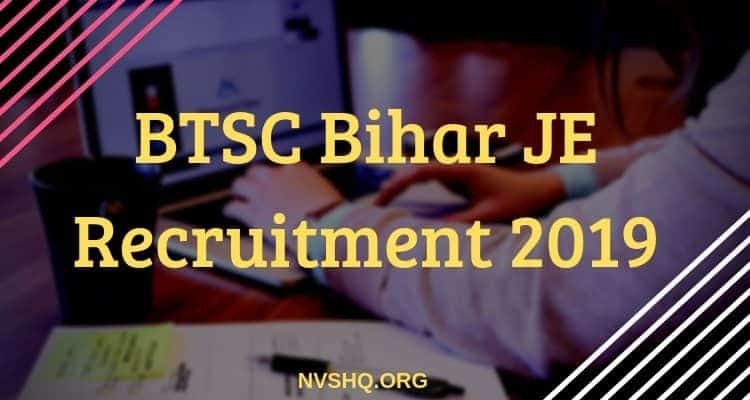 Through BTSC JE recruitment, Bihar Technical Service Board (BTSC) will recruit 6379 Junior Engineers (Civil, Mechanical and Engineer) for various departments of Bihar Government. Selection of the suitable candidates will be done on the basis of merit in qualifying exam (diploma/certificate/graduation etc.) and experience. No selection test will be conducted. Candidates interested in this recruitments can collect necessary information from this article. Application for BSTC recruitment can be made only through the online mode. Applications through other mode will not be accepted. Candidates must read all the instructions carefully before filling the application form. They must keep all the documents handy at the time of application. Candidates can use of the following photo ID card in the application- Aadhaar card/ Voter ID/ Passport/ PAN card/ Driving License/ any other ID card issued from state or central government. They must have a valid email and working mobile no. All details should be filled carefully in the application form. Modification in application details can be made only in the given time period. The last date for modification in the application form after final submission is 15th April 2019. Incomplete, inaccurate and unattested application forms will not be accepted in any circumstances. Visit the official website first (http://pariksha.nic.in). Click on “Apply Now” link given on the homepage. Reader the user instructions and click on “Candidate registration”. Registration slip consisting of registration no. will be generated. After successful registration, make the payment of application fee by clicking on “Fee deposition/ Reconciliation”. After successful payment of application fee click on “Submit Application form link”. Fill the details asked and complete form. Fill personal details, notification details, bank transaction details, education details, etc. Also, upload the required documents and go through the declaration details. Click on preview button. Check all the details carefully and make correction if required. Click on button to finally submit the application form. Lastly, take the printout of the application form. Application fees can be paid through credit card, Debit card, net banking or SBI e-challan. Applicants should keep the application fee receipt save with them. Before filling the online application, it is compulsory for all the candidates to check the eligibility requirements first. Only after satisfying the eligibility criteria they should fill the online application. Candidates from the state of Bihar and outside Bihar are eligible. However, candidates who claim for reservation on the basis of caste/community must be only from the state of Bihar and should possess a domicile issued by the competent authority. The minimum age of the candidates should be 18 years as on 1st August 2019. For more information on age criteria, candidates are advised to read the official notification. 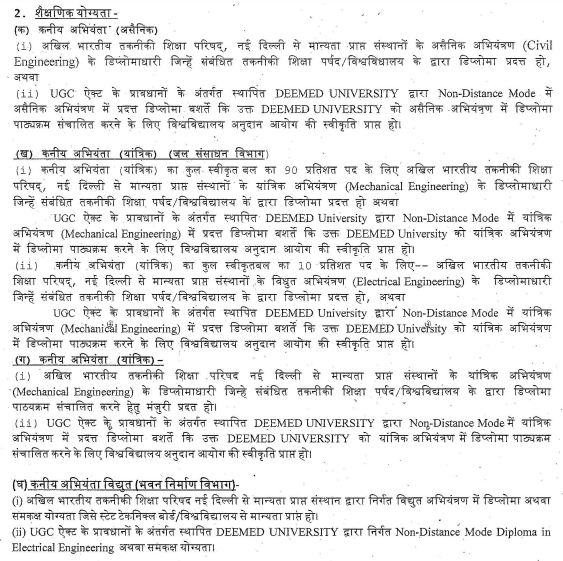 Selection of the candidates for the post of JE in various departments will be made on the basis of analysis of the diploma and other educational qualification of the candidates. After completion of application process, scrutiny of applications will start and on the basis of that merit list or select of the candidates will be prepared. Bihar JE result will be published on Commissions website on notified dates. Candidates have to check it from there only. After the release of merit list, selected candidates will be called for counseling process. The counseling schedule and other details will be shared later. BTSC Bihar JE recruitment application forms are currently available. Mere registration and payment of application fee does not imply that application form has been successfully submitted. Candidates must ensure that the registered email and mobile number is active throughout the selection process. Applicants must preserve the hard copy of the application form and should produce it at the time of counseling and whenever it is required to be produced. Reservation will be provided only to the candidates who claim for it. In order avail reservation benefit they must fill the reservation column in the application form; without this, no reservation will be provided. Candidates claiming for any kind of reservation must possess supporting documents.